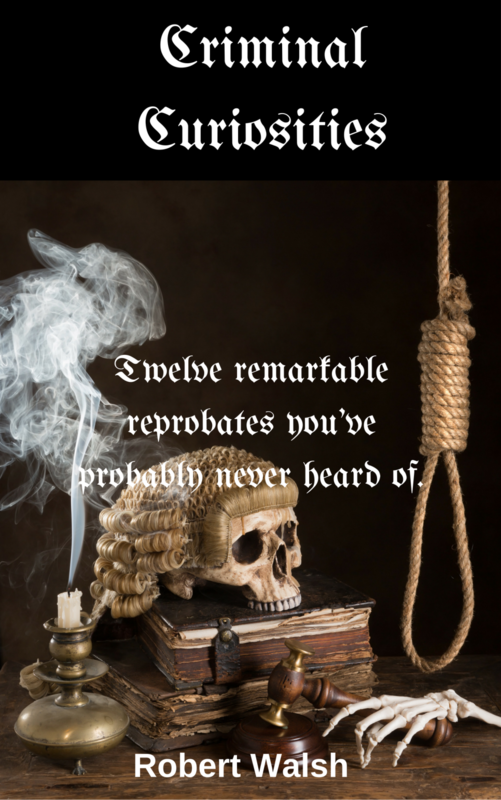 Criminal Curiosities: Twelve Remarkable reprobates you've probably never heard of. Out now for the Amazon Kindle. As a crime writer with a long-time interest in crime's more unusual aspects, I often try to find some of its more overlooked stories. Who needs yet another rehash of Jack the Ripper or JFK reshuffling old evidence while seldom offering anything new? Apart from accountants at publishing companies wanting bestsellers to boost their quarterly balance sheets, at any rate? All walks of life have their pioneers, those who stand out as the first, last or only example in thier field. Crime is no exception., but crime's stand-outs are seldom as widely acknowledged as, say, the first Moon landing or the discovery of the New World. It's time that changed. Criminal Curiosities is a small step toward that. Some readers will have heard of William Kemmler or Herbert Rowse Armstrong. Kemmler was, after all, the first convict ever to be legally electrocuted. Armstrong was (and remains, the UK having abolished capital punishment) the first and only British lawyer to be hanged for murder. But who was the first convict to face the guillotine? Why were legendary figures Thomas Edison and George Westinghouse so closely entwined with William Kemmler and he with them? Whose murder trial saw the victim's body transported to the scene of the crime, then used in a live reconstruction in front of the jury? 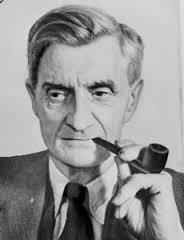 And how on earth did Dutch art forger Han van Meegeren get away with trading a fake Vermeer for 137 genuine paintings (today worth around $60 million with, of all people, Gestapo founder and Luftwaffe commander Herman Goering? You probably don't know. Criminal Curiosities is where you find out. They're all singular in their own particular way. All have a fascinating tale to tell of their own misdeeds and how they sometimes forever changed the world around them. All of them are often overlooked and some are barely historical footnotes, if that. Criminal Curiosities is currently available for the Amazon Kindle. James Wells, America's worst botched execution. Initial problems involved untried equipment, new ideas and inexperienced executioners. 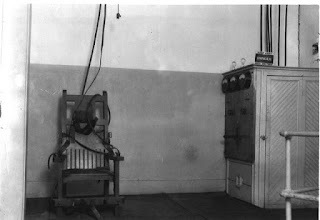 Limited knowledge of inflicting humane electrocution spawned a series of experimental executions. Successive inmates endured different numbers of electrodes, different voltages applied for different durations, electrodes placed on different body parts and so on. In 1892 Charles McElvaine’s hands were placed in tubs of brine to conduct the voltage. He suffered horribly before the now-standard head and leg electrodes were used instead. Malfunctioning or ill-prepared equipment (in the case of Willie Francis and so many others) has also caused horrific scenes in America’s death chambers. 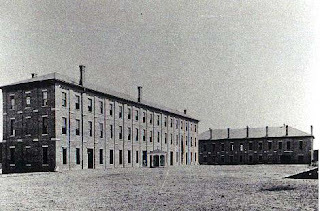 What happened at the former Arkansas State Penitentiary in Little Rock (since demolished and replaced by public buildings) on March 10, 1922 made Kemmler’s suffering look comparatively minor. Murderer and escapee James Wells endured perhaps the worst-botched execution in American history. Wells, born in 1904 and hailing from Drew County, was an African-American farmhand. Convicted of murdering white Arkansas farmer Peter Trenz (his former employer) on May 18, 1921 Wells was never likely to avoid Old Sparky. He was a poor, black defendant convicted of murdering a respectable white victim. In those less-enlightened times, many whites considered that reason enough. 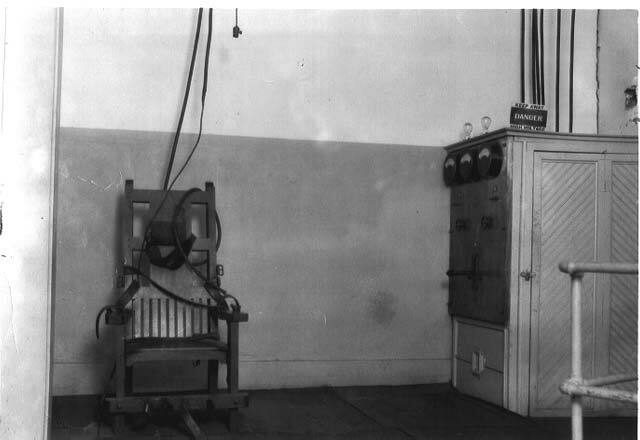 Arkansas introduced electrocution in 1913, the State also taking over executions from individual counties. During the chair’s lengthy tenure Arkansas executed 195 prisoners. Of these two were Native American men, one white woman, one Hispanic male and 57 white males. The rest, 143 men, were all African-American. Warden Luther Castling had resigned rather than electrocute the ten men then waiting to die. His successor Warden Dempsey didn't have similar qualms. Aside from being poor, black and convicted of murdering a white when lynching and legal execution was equally likely for that crime, Wells hadn’t exactly done himself any favors after his conviction. On December 9, 1921 condemned killer, bank robber and serial escaper Tom Slaughter managed a spectacular escape from ‘The Walls’ and Death Row itself. Overpowering guards, Slaughter took the Warden’s family hostage, escaping in Warden Dempsey’s car. Dempsey, whose job it had been to carry out executions, soon found himself unemployed. That in turn caused an excruciating death for Wells. Slaughter had invited the other condemned inmates to join him. Wells, believing his appeal would almost certainly fail, escaped with him. Slaughter survived only a day before being shot by fellow-escaper Jack Howard. Howard claimed to have escaped only to help bring Slaughter to justice, a claim accepted by Arkansas authorities. Howard was never charged over Slaughter’s death, being pardoned and released several years later. Wells, soon recaptured, returned to Death Row. He’d escaped on December 9, been recaptured within days and his appeal was denied on Christmas Eve, 1921. A foolish time to attempt escape and humiliate the Arkansas justice system. Not much of a Christmas present, either. That said, nothing can justify what happened at his execution. On March 10, 1922 all the usual preparations had been made. All that remained was for the executioner to do his job competently and professionally. 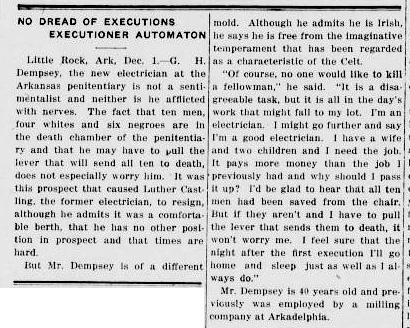 With Warden Dempsey gone, the new executioner was an Englishman, a former car salesman whose sole qualification and experience consisted of having (as he himself put it) taken ‘a correspondence course in electricity.’ The State of Arkansas had entrusted a delicate, potentially dangerous task to a man utterly lacking expertise, training or experience. It was suggested at the time that the nameless volunteer arrived drunk. Wells was certainly silenced by the first jolt, but he wasn’t dead. Either the first jolt was far too brief or the voltage far too low. Still alive, Wells needed another. Shocked again, he remained alive. A third jolt was called for. The witnesses began looking uncomfortable. Inmates were supposed to sit down quietly, say their last words and die. A second jolt might be delivered to make sure, but seldom more than that. The executioner shocked Wells repeatedly. Repeatedly the current crackled, doctors checking between jolts. Wells simply wouldn’t die. After the first jolts had failed horrified witnesses began leaving the execution chamber. With every unsuccessful jolt the remaining witnesses’ disgust grew. By the eleventh jolt everyone involved just wanted it to end. For the twelfth time the switch was thrown, the current crackled and Wells leapt against the restraints. The power was shut off while doctors checked yet again. James Wells was finally dead. The disaster was publicised in Arkansas, Utah, California, Texas, Tennessee and numerous other States where executions, especially of African-Americans, seldom garnered more than a line or two. Had Arkansas employed an expert like New York’s Robert Greene Elliott, the nightmarish exhibition would almost certainly have never happened. Elliott performed 387 executions in six States, perfecting the ‘Elliott Technique’; 2000 volts for three seconds, 500 volts for 57 seconds,, 2000 volts for another three seconds, 500 for 57 seconds and a final burst of 2000 volts. Very rarely did he need to deliver more than one cycle. A bitter irony that, as his executioner, Wells couldn’t have been in safer hands. Gruesome Spectacles; Botched executions and America's Death Penalty, Austin Sarat, 2014, Stanford Law Books.